An initial pseudostate is an element of a state machine. It is automatically processed when the state that contains the initial pseudostate is entered (and thus all of its regions are). An initial pseudostate belongs to a region. An initial pseudostate is shown as a small solid filled circle. When a state machine is started, initial pseudostates are searched in all regions of the root state. This search then recursively continues in each state that is a target of a transition whose source is one of the previously found initial pseudostates. It has exactly one outgoing transition. It has no incoming transitions. The outgoing transition can have a behavior, but it cannot have triggers or guards. Each region can contain at most one initial pseudostate. The target of the outgoing transition of the initial pseudostate is always a state. 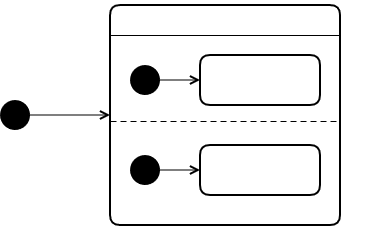 There is no interpretation of and deviation from the UML specification for a state machine's initial pseudostate.